United Sign: The Wind Sign Curb Frame! The Wind Sign Curb Frame! What's in a sign? What is it about a sign that helps maximize your message and gives you the value of being able to change it? Where do you find a sign that's durable, attractive and priced to help you grab some attention? Well, we'll tell ya! You need a sign to attract some attention, point out goods and services, and you need it to be able to withstand the elements and stay looking good. We offer a wide array of signs and they can fit any budget! You might even be able to score a deal! 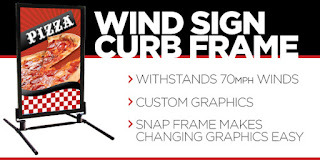 Take a look at the Wind Sign Curb Frame. It's a real champ when it comes to grabbing some attention! The frame itself goes together in about 10 minutes and the sides of the frame snap open and shut to hold your sign in place. The signs can be customized, or we have a great selection of ready to roll signs for food, car washes, coffee and more! Say you sell out of donuts in the morning? Change the sign to show your customers what's on the lunch menu! The Wind Sign Curb Frame can withstand high winds, UV light and the rigors of standing out in a world of seemingly endless messaging. Give us a call today at 800-821-6530 or click on the image for a "Quick Quote" and we'll be in touch as soon as possible! Thanks for your time, we appreciate you taking a minute to learn a little more about the products and services we offer!